Right after an event is triggered. In the scheduled specified time after the appointment. In the scheduled specified time of the day. For the 2. and 3. notifications types, it is necessary to set up a cron job on your server. You can see below how to configure these notifications. To Employee – notifications you can enable/disable for sending to the employee. Five notification types are same for customer and employee: Appointment Approved, Appointment Pending, Appointment Rejected, Appointment Canceled and Appointment Rescheduled; and three are only available for the customer: Appointment Next Day Reminder, Appointment Follow Up and Birthday Greeting. We will briefly explain each of them. 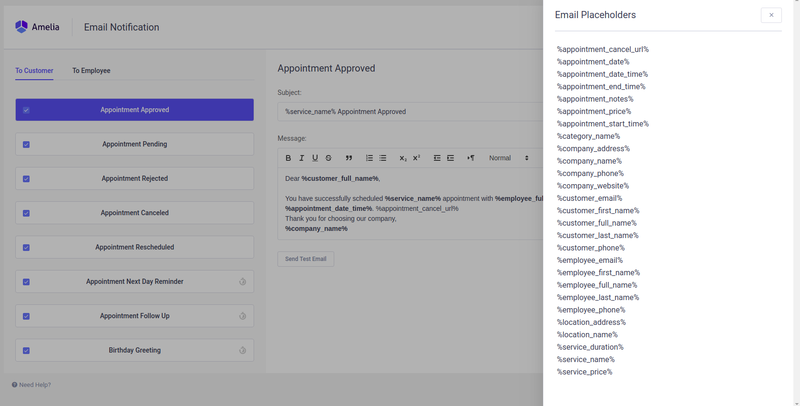 This email message will be sent right after your customer finishes the booking procedure, or after an appointment is created from the back-end of the plugin, if the default status of your appointment is Approved. This notification is available for both – the customer and the employee, but you can uncheck one of them if you don’t want it to be sent to both. Please note: If you want to send this email notification right after the appointment is scheduled, make sure you’ve set “Default Appointment Status” as Approved in the General Setting. If you’ve set “Default Appointment Status” as Pending this notification will be sent after you manually change the appointment status on the back-end. More about this here. This email will be sent when the appointment is created but with a Pending status. You can set your “Default Appointment Status” as Pending, so every time a new appointment is created this email will be sent. The appointment will get a Pending status, so you will need to manually confirm it in the back-end of the plugin. This email is sent after the appointment is rejected. By default, an appointment can be rejected by the administrator or the manager. However, you can give permissions to the employees to reject their appointments by enabling the Allow employees managing their appointments option in General Settings. So, once the appointment is rejected the customer or employee will get an email about this action. This email will be sent after your customer cancels the appointment. The Cancel option is available for customers at the back-end of the plugin and through the cancel URL link in email, so once the customer cancels the appointment an email about this action will be sent to your customer and/or employee. By default, the administrator and the manager can move the appointment in the calendar or edit date and time in the “Edit appointment” dialog. You can also give permissions to the employees to reject their appointments by enabling the option in General Settings. Either way, once you enable this notification, every time when the date and/or time details of the appointment changes the email will be sent. With this notification you can remind your customer or employee about at next day appointment. In the upper right side of the page, you will see an option Scheduled For where you can choose a time when this notification will be sent. Once you’ve chosen the time and message, click on the Save button, otherwise, the chosen notification time will not be saved. This is one of the two notifications available only to the customer. With this notification, you can send a follow-up email to thank your customer for coming or give some additional information. In the upper right side of the page, you will see an option to choose a time and schedule for this email. If you choose 1 hour, for example, the email will be sent to your customer 1 hour after the appointment. When you’ve finished configuring the notification, click Save and your notification message will be saved for sending. With this email, you can congratulate your customer on their birthday. To be able to send this email you need to have filled in the Date of Birth option in the customer’s dialog. Choose a birthday greeting text and a time in the Scheduled For option when this email will be sent and click Save to keep your settings. To set up notifications you must first configure “Notification Settings” on the Amelia Booking Settings page. Settings that are mandatory are “Sender Name” and “Sender Email”. By the default, Mail Service is set to “PHP Mail” but we strongly recommend changing to an other mail server. Each notification is enabled by default and it is possible to disable notifications if you want to prevent from being sent. Also, it comes with the default “Subject” and “Message” that can be changed. In the “Subject” and in the “Message” it is possible to use placeholders. Click on the Show Email Codes button in the upper right side of the Notifications page and a dialog with placeholders will appear. Choose the one you need, click on it, the placeholder will be copied, after which you will paste it into the text area. In the real notifications received by your customers and employees, placeholders will be replaced with real data. You can see the more detailed tutorial how to set up cron at this link, or you can follow our explanation on the FAQ page.